The inimitable Rapala® Shad Rap® and the venerable DT® (Dives-To) Series are now available in five new lifelike, seasonally specific retreating-craw patterns: Blaze, Delta, Mossy, Ole Blue and Rusty. Blaze is mostly orange from tip to tail, with a red-shaded back, yellow claw accents and realistic shell-pattern details throughout. Delta is dark red from tip to tail, with a black-red back and sides, light-red claw highlights and realistic shell-pattern details throughout. Mossy is moss green from tip to tail, with green-yellow claw highlights and realistic shell-pattern details throughout. Ole Blue is blue from tip to tail, with white-blue claw and side highlights and realistic shell-pattern details throughout. Rusty has red claws, a brown body with yellow side highlights and realistic shell-pattern details throughout. A proven classic, the Shad Rap® is equally effective whether cast or trolled and is designed to be fished from ultra-slow to super-fast speeds with superior results. Rapala’s DT® Series of crankbaits dive fast to a pre-set depth and stay in the strike zone longer than any than other crankbait on the market. They combine carefully placed internal weights, a tapered fuselage and a thin tail to create the ultimate crankbait action. 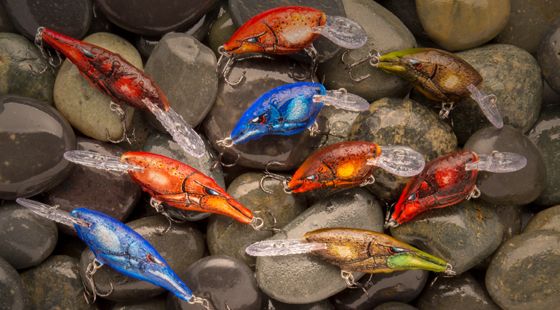 Both the Shad Rap® and DT® Series baits are built from balsa wood, creating a swimming action unmatched by other crankbaits in the marketplace. For more information visit www.Rapala.com. And, be sure to check out Facebook.com/RapalaUSA for the latest tips and tricks to take your angling acumen to the next level. This entry was posted in Rapala and tagged DT, Rapala, Shad Rap. Bookmark the permalink.